I was so excited the other day to find a nest in my bluebird box that I thought straight-away about writing to tell you about it. I was out planting some onion sets in the gardem—a little later than I had planned—and decided to peek inside the bluebird box. To my surprise and delight I found a nest inside, already. I just put it up a few weeks ago. You can imagine what I did when I discovered the nest, can't you? Yes, I ran down to the local bird feeding store and bought two packets of freeze-dried mealworms and two little dish holders to put them in. I remarked that the mealworms looked gross and the manager said straight-away, "You're a gardener, they shouldn't gross you out." And she was right. They didn't really gross me out. I am a gardener. But one might look around here these days and think that I also like to feed the birds. I've always had a few feeders that I kept mostly full of bird seed in the back garden. Then last fall I was sitting at my desk in the library looking out the front window at the crabapple tree. I noticed a few birds amongst the branches and an old nest and decided it was a good place for a bird feeder. After all, I sit at that desk a lot these days writing. So I grabbed an old, empty feeder from the back garden and moved it to the crabapple tree and filled it with some old seed I had in my garage. Then I waited. And waited. And waited. The birds ignored the dinner I set out for them. I realized, of course, the seed was probably stale and the birds wouldn't eat it no matter how hungry they got. Thus I made my first trip to the bird feeding store and came away with a tube feeder and a fresh bag of mixed seed, plus a platform feeder and special safflower seed. That did the trick. I had birds. Finches and cardinals, primarily. Then a woodpecker showed up and started pecking on the tree. Back to the store. This time I bought a suet holder and a wire wreath to put peanuts in. One day in January, I was watching the birds feeding and saw a bluebird on the rim of the bird bath. Yep, that's why I decided I needed bluebird houses, and now mealworms. Did I mention on one of my many trips to the bird feeding store I bought a hummingbird feeder and a special bottle to mix up the sugar solution in? I did. The store manager told me to set it out around April 15th. Of course, I'm a gardener so I'll also get some flowers for the hummingbirds to sip from, too. By the way, the two feeders left in the back garden have been more or less destroyed by squirrels, so I went back to the bird feeding store to get a more substantial feeder to replace those. I mostly put black-oil sunflower seeds in those and don't care much if squirrels eat it, too. I do mind when the squirrels try to get to the peanut wreath in front. Those peanuts are for bluejays and woodpeckers, which I see every day. Anyway, I'm a gardener not a bird feeder but since I have a garden and there are good places for birds to nest and hide, why not also put out some bits of alpaca fur for them to use to line their nests? I bought some on Etsy and it appears they are taking bits of it every day. Well, I've got to go now. I need to fill feeders, check bird baths, and oh, look, there's a blue jay, a cardinal, and a red finch out the window. And did I mention I saw a northern flicker one day, and bought a book on bird identification, a book on "birdscaping", and a book on feeding birds in your garden? I've really got to go now and tap the window to scare off the squirrel again. I get a lot of exercise from getting up every 15 minutes to scare off the squirrel. P.S. I am still thinking of ideas for marketing my book. 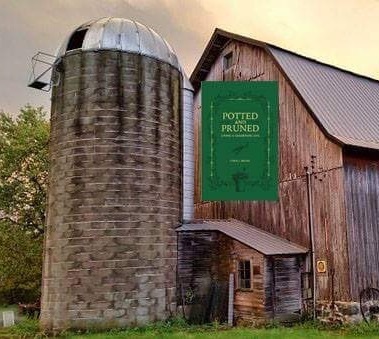 What do you think about painting it on barns, to replace the Mail Pouch tobacco ads? Sounds to me like you have been having too much fun. I knew some people that were in their garden so much that they could hand feed their cardinals. Now there is a goal for you. ;) I do think birds bring a lot of life into the garden. I love watching the birds at my feeders. I have safflower seeds in one for the cardinals and thistle seed in the other for those cute finches. I like feeding the birds! Lately, though, I've been battling black crows. They clean out the feeder within minutes, leaving my Cardinals and Bluejays squawking for food. Any suggestions on how to get these birds to move on? I feed my birds very expensive mixtures, so I really need some advice.